One Good Question with Peter Howe: Are We Incentivizing the Right Behaviors for Teachers and Students? I trained as an economist (then an art historian, then an educator), so I’m fascinated by this question. In Dan Ariely’s Predictably Irrational, he gives us the bad news first: economics is built upon the entirely false premise that people are rationale. The good news is that people are irrational in a predictable way. His experiments demonstrate how financial incentives to “do good” actually backfire. The implication is that, as soon as you provide monetary reward for “doing good,” the action becomes transactional. People’s sense of being valued is entirely different. When we think that we’re acting on behalf of shared humanity, we do more. When we anticipate compensation for the same behavior, we calculate our value and actually refuse to perform for lower compensation. Earlier this fall, Paul Tough’s article in The Atlantic pointed out the distinction between teachers who raise test results and those who raise character attributes. The teachers didn’t overlap much across groups, they were either in one camp or the other. What he found was that the teachers who raised test scores were the ones being rewarded by their schools, but that the skills students really need for college readiness are the social emotional ones. That’s a great example of how our investments obscure what we project as the best outcome, in this case college persistence. When we apply Ariely’s premise to schools, the incentive should be placed on building community. If we build the real community expectation, all of our members are more likely to contribute to each other’s success. When we apply financial incentives for some members, for example compensating teachers for student test results, the teachers narrow their focus and supports, and as a result fewer students achieve at high levels. It’s literally a waste of money and creates the wrong incentives at the classroom level. My favorite professor used Hegelian dialectics to teach a course in behavioural accounting. He would post on the door how well we were doing in recounting, connecting, synthesizing, and using connections to build something new—at which point you were at the pinnacle of learning. Even though our content was economics, he rewarded our thought process over discrete test scores. To go back to our example, make sure that the finances are rewarding the behavior that you want. Then you don’t waste money with incentive programs that go fundamentally against people’s needs. People want to feel valued and our investments should reflect that. If schools could only accomplish one outcome for all students, and could guarantee that outcome for all students, what would it be? Every kid has to have that sense of safety and security – however we define that. Research shows that the traumatized or stressed brain is not a thinking brain. Kids in poverty have higher indicators on the ACE scale of trauma and also higher suspension rates. Being a part of a community is the most important contribution to safety and security. Creating a sense of security isn’t only about environmental stress, but engendering intellectual safety as well. The classroom is not about individual student success, it’s about collective success. No student pisses me off more than the top student who stops coming to class close to the exam because they would rather study on their own. At that point, they’re no longer modeling engagement, and their peers don’t benefit from the tough or complex questions that would have been asked. How do we address needs on both ends of the spectrum? We should focus the first two months of the year on community building and not curriculum. Once you have the community established and students are in inquiry-based learning, the curricular work will move more quickly. All of the students will have that sense of safety, trust and willingness to admit that they don’t know something. That’s when learning can really occur! Peter’s One Good Question: Why are you here ? I ask this to every student who comes to my office, which is usually in a disciplinary context. I think that you can extend the question to education institutions too – Why are you doing X? Why are you doing it in that way? About Peter : Peter Howe is currently Head of College at United World College’s Maastricht (NL) campus. He recently was appointed to the role of Principal of UWC Atlantic College in Great Britain, effective 1 March 2017. 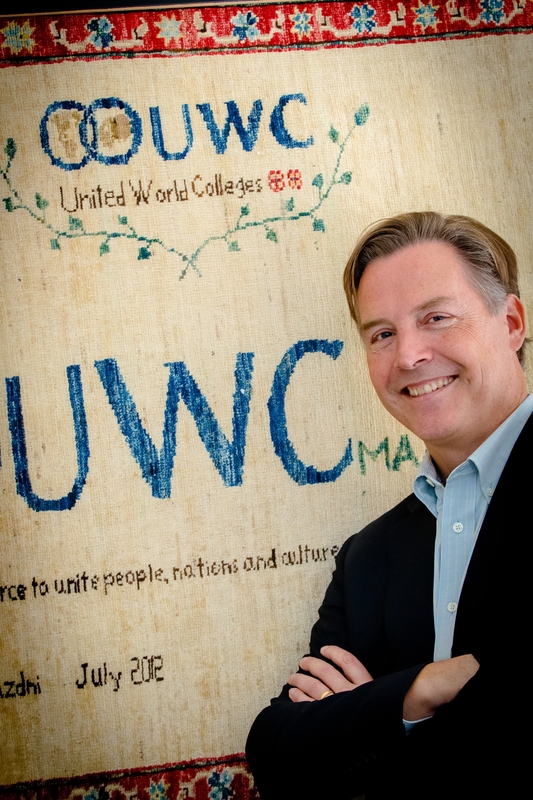 Peter joined UWC Maastricht after spending seven years at UWC Adriatic in Italy, four of which as the Head of the college. In the course of five years at UWC Maastricht, Peter has managed a student body of approximately 850 students, in a school that has grown by more than 40% since 2012. Peter brings an eclectic background to his position. Following an undergraduate degree in Finance and Economics and 2 years working at Procter and Gamble in his native Canada, he returned to study graduate Art and Architectural History for 7 years before embarking on his teaching career. Next PostOne Good Question with Denese Shervington: How do we re-engage the Black middle class in public education?